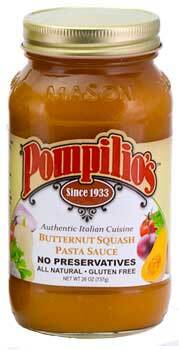 Since 1933 Pompilio's Restaurant has been serving authentic Italian cuisine since Prohibition. Their Butternut Squash captures the comforting flavor of an Old World harvest in a slightly sweet sauce with a hint of fresh tomato. Ingredients Butternut Squash, Water, Tomato Paste, Red Onions, Celery, Honey, Salt, Garlic, Balsamic Vinegar, Spices, and Citric Acid.